1. Transaction commences outside the territory of India and are concluded also outside territory of India. 2. Transaction commences outside the territory of India but concluded by entering the territory of India. High Sea Sales from the point of view of an entity incorporated in India refers to the sale of goods which is made after the goods cross the Custom Barriers of the Foreign Nation but before crossing (entering) the Custom frontiers of India by way of transfer of document of title. As per Section- 2(79) of CGST Act, 2017– Non- taxable territory means the territory which is outside the taxable territory. 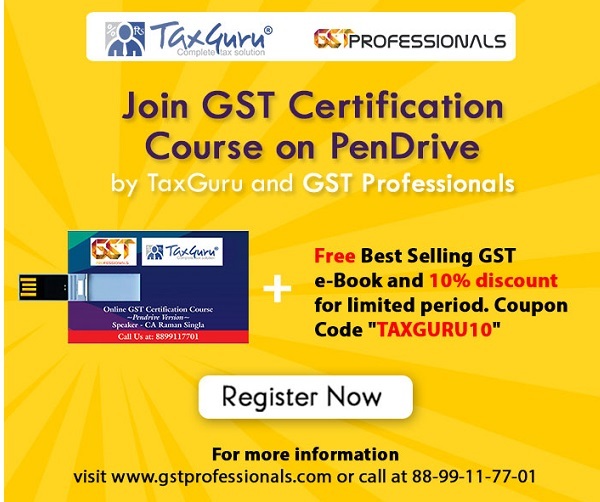 A taxable territory means the territory to which the provision of GST Law applies. Accordingly, in CGST law, the taxable territory would cover all locations covered under the extent of law. i.e. whole of India. Accordingly, locations outside India would be considered as non- taxable territory, being the territory outside taxable territory. In this regard, it would be relevant to understand the geographical extent covered within the meaning of the term “India”. Supply taking place in a “non- taxable territory” would be outside the jurisdiction for imposing any GST. High Sea Sales (first supply) are not liable to GST. As per Section- 7(2) of IGST Act, 2017 supply of goods imported into territory of India, till they cross custom frontiers of India, shall be treated a supply of goods in the course of inter-state trade or commerce. f) Area in which imported goods meant for export are ordinarily kept before clearance by Custom Authorities. Where a transfer of documents of title takes place during import, the question of payment of tax by the importer would not arise since the documents of title would be transferred before the goods cross the custom frontiers of India. It has been clarified vide Circular No- 33/2017- Customs dated 1st August 2017, that IGST on High Sea Sales transaction on imported goods, whether one or multiple, shall be levied and collected only at the time of importation i.e. when the import declarations are filed before the Custom authorities for the custom clearance purposes for the first time. For example- A company in Germany supplies goods from Germany to another company in Sri Lanka — this is not a supply in the course of inter-state trade or commerce because it commences and concludes outside the territory of India. It would be so, even if the goods were supplied by the company in Germany from Germany to a customer incorporated in India if the goods are not ‘brought’ into India but sold in high seas to yet another company in Singapore. In order for every supply to come within the operation of Section 7(2) of IGST Act it requires that the resultant effect of the supply must cause the goods to enter the territory of India. This Act does not enjoy extra- territorial jurisdiction and is limited to imposing tax if the goods are imported into the territory of India. The same is supported by Authority of Advance Rulings Kerala Order No- CT/2275/18-3 dated March 26, 2018. For example:- Goods have been imported from France by a company incorporated and registered in Nasik which have landed at Mumbai port but during their clearance are supplied by the Nasik company to a company in Pune, this supply continues to be in the course of inter-state trade or commerce. Even though the supplier is in Nasik and the recipient is in Pune, since the goods have not yet crossed the customs frontiers of India at the time of supply. This supply comes within the operation of Section 7(2) of IGST. Transactions taking place before filing of bill of entry are termed as “high sea sale” transactions under common trade practice where the original importer sells the goods to a third person before the goods are entered for customs clearance. This supply is covered within definition of inter-state supply. Provisions of Section 3(12) of Customs Tariff Act, 1975 in as much as in respect of imported goods provides that all duties, taxes, cess’ etc. shall be collected at the time of importation i.e. when the import declarations are filed before the customs authorities for the customs clearance purposes. Hence, IGST on high sea sale(s) transactions of imported goods, whether one or multiple, shall be levied and collected only at the time of importation. Conclusion- Goods are liable to IGST when they are imported into India and the IGST is payable at the time of importation of goods into India. where we disclose the sale and purchase in GST return? Kindly explain. Whether such high sea sales to be treated as nil-rated or exempt in the hands of original importer? I would like to know whether Commission charged on High Sea Sales Charged by Saler (both Parties in Taxable Territory) is liable to GST ? how to record the the Transaction commences outside the territory of India and are concluded also outside territory of India. in the books of accounts and in gst returns.